The Gingerbread Man and the Leprechaun Loose at School by Laura Murray, illustrated by Mike Lowery, is a book from the series The Gingerbread Man on the Loose, and it pairs the resourceful gingerbread man’s wits with those of a mischievous leprechaun. The leprechaun is on the loose in the school and making big messes. The gingerbread man wants to help his classmates, so he goes on a search for the leprechaun mischief maker with the help of some witty, rhyming notes with clues as to his whereabouts. My daughter had some challenging words to read in this book like “leprechaun” but for the most part, it was a fun easy read for her. She loved how the gingerbread man trapped the mischief-maker and made him cleanup all those messes. She’s on track to read another 400 minutes this month, and I think she’s getting better the more she practices. The Gingerbread Man and the Leprechaun Loose at School by Laura Murray, illustrated by Mike Lowery, is just one book in a series, and I think my daughter should find more of these to read as she had so much fun with them. I Dissent: Ruth Bader Ginsburg Makes Her Mark by Debbie Levy, illustrated by Elizabeth Baddeley, is currently the oldest U.S. Supreme Court justice, but she’s also a woman who understands what it is like to be told she cannot do something because she is female or because she is Jewish. Even as these moments must have been disheartening and made her sad, she persisted and resisted. These are phrases that are common in today’s world as many women are finding their voice and standing up for greater equality for all — men and women alike. Imagine a time in history when women were told to find a husband instead of go to college or even law school. Imagine being one of 10 female students in law school where there were 500 men in one class. Imagine doing your best and there were still impediments to getting the job you wanted. These are the obstacles Ginsburg dealt with as a young woman and mother, but these are also the same obstacles that many minorities still face even in the 21st Century. When reading this book with my daughter, she thought it was weird that Ginsburg was told she couldn’t be a lawyer because she was a mother and that she wouldn’t pay attention at work. She also thought it was mean that Jews were not allowed in certain places. My daughter’s world is different in many ways, but in many ways still the same. I loved how Levy portrays Ginsburg’s tenacity without preaching and how she makes her relateable to elementary school kids, but does not talk down to them. Ginsburg’s career and its law speak may be hard for some kids to understand, even the word “dissent” may need explanation. But this book will open a dialogue with children. I love that Levy has created a downloadable curriculum guide for classrooms, as well as the Glorious RBG Blog. I Dissent: Ruth Bader Ginsburg Makes Her Mark by Debbie Levy, illustrated by Elizabeth Baddeley, is a wonderful addition to my daughter’s library at school, and funny enough, I purchased her a copy for her upcoming birthday this week. Debbie Levy writes books of fiction, nonfiction, and poetry for people of all ages, particularly young people. Before becoming an author, she was a newspaper editor with American Lawyer Media and Legal Times; and before that, Levy was a lawyer with the Washington, D.C. law firm of Wilmer, Cutler & Pickering (now called WilmerHale). She lives in Maryland with her husband, Rick Hoffman. Where the Past Begins: A Writer’s Memoir by Amy Tan, read by the author and Daniel Halpern, includes not only past experiences with her siblings, her mother, and her father, but also editorial notes and emails between herself and her editor as she struggles to write a book about writing — a book the ends up being a memoir of a writer. Readers take a journey with Tan through memorabilia and letters between herself and her mother. It is an emotionally read memoir, with deeply sad losses from her childhood and her own internalized memories of slights she received from her parents. Imagine how children view our comments and reactions to their behaviors; Tan makes a study of those things in her memoir as she strives to assess her own writing and her own quirks as a writer. Through her creative reflections on her past and her own writing process for The Valley of Amazement and other books, readers are given a glimpse into her life, her emotional baggage, her forward thinking perspective on women and their accomplishments, and her devastation over the recent election. Do not think she’s overly political here, because it is more about her emotional reflections on those events and how she perceived her parents would have voted. Where the Past Begins: A Writer’s Memoir by Amy Tan, read by the author and Daniel Halpern, is a valley of amazement all its own, and readers of her novels will enjoy learning about her struggles with her parental relationships, the secrets she uncovers and speculates about, and her emotional confessions about it all. Amy Tan is an American writer whose works explore mother-daughter relationships and what it means to grow up as a first generation Asian American. In 1993, Tan’s adaptation of her most popular fiction work, The Joy Luck Club, became a commercially successful film. She has written several other books, including The Kitchen God’s Wife, The Hundred Secret Senses, and The Bonesetter’s Daughter, and a collection of non-fiction essays entitled The Opposite of Fate: A Book of Musings. Her most recent book, Saving Fish From Drowning, explores the tribulations experienced by a group of people who disappear while on an art expedition into the jungles of Burma. In addition, Tan has written two children’s books: The Moon Lady (1992) and Sagwa, The Chinese Siamese Cat (1994), which was turned into an animated series airing on PBS. She has also appeared on PBS in a short spot on encouraging children to write. Currently, she is the literary editor for West, Los Angeles Times’ Sunday magazine. A Monster Calls by Patrick Ness, which was our October book club selection, is a deeply emotional book about loss and guilt and letting go. Conor O’Malley is 13, but his burdens are great as he cares for himself the best he can while his mother clearly ill from chemotherapy. She is barely able to wake up and move about. At school, his life is gray and the only color he finds is in his encounters with the bullies at school because they provide him what he wants — punishment. It is a deeply atmospheric novel in which the gray and black emotions of Conor permeate all that goes on. The Monster who visits him each evening tells him three stories, and Conor expects them to teach him something, but what Conor must learn is something he can only teach himself through experience. The Monster, however, is not his recurring nightmare. And the Monster, though fearsome, seems to be the darkness inside him and not an actual monster. We all carry monstrous emotions and we try to keep them hidden — sometimes even from ourselves. Through magical realism, Ness has created a tale for teens and adults alike that will ensure they look inward and assess their own pain, guilt, and loss in a new way. A Monster Calls by Patrick Ness is deeply affecting. Readers will long feel the sorrow and the heaviness of this one, but it is darkly humorous in parts. While one of the monster’s tales is a bit muddled, it could be attributed to the 13-year-old’s imagination in how it fails to fully parallel the other tales. Ness is a crafty storyteller, and his Conor is every boy ever deeply impacted by loss, abandonment, and other dark emotions. Everyone at the meeting liked the book very well and really felt engaged with the narrative and Conor’s emotions. The biggest debate was whether the monster was a real entity or in Conor’s mind. It was interesting to listen to the theories that members had about the individual tales the monster told and how they paralleled Conor’s predicament. Lilac Girls by Martha Hall Kelly, narrated by Cassandra Campbell, Kathleen Gati, and Kathrin Kana — which was our September book club selection — is an expertly woven tale of Caroline Ferriday’s lilac girls, or the Ravensbrück rabbits, who were experimented on in a German WWII camp. Ferriday, who was a real woman, is a socialite who soon realizes that her work with French nationals is more about helping others than it is about her social status, even as she falls for a married French actor and considers a different life for herself. Told in alternate points of view — Ferriday, polish teen Kasia Kuzmerick, and a young ambitious German Dr. Herta Oberheuser — Kelly’s trifecta pushes readers deep into the emotional baggage of WWII and the relationships that carry each woman through. Clearly well researched, Ferriday comes to life as a woman with little else to do but mourn her father and help those in need, while Kasia has a lot to learn even as she plunges headlong into the resistance to impress a boy. Meanwhile, Herta — the most educated of the three — seems to have learned little compassion for others, instead remaining focused on how to get ahead as a medical professional, no matter the cost. Even the German doctor appears sympathetic at first, until we see how camp life hardens her against humanity. Kasia wears her camp damage on her at all times, pushing even her family away when it is clear she needs them most. Meanwhile, Ferriday’s romantic troubles seem trivial in comparison, though it is clear they will push her into something that will become her life’s work — a search for justice for those who need it most. It will be hard to look away from these women as they deal with the harsh experiments perpetrated by the Nazis, and they are set on their own paths and learn how best to move on with their lives after the war is over. Kelly has lived with these women for some time, and it shows in her deeply dynamic characterization of the real-life Ferriday and Oberheuser; Kasia and her sister also are clearly based on real life accounts as their sisterly bond becomes a rock on which they can rely in even the toughest moments. Even if you think you’ve read everything about WWII, this is not to be missed. Lilac Girls by Martha Hall Kelly, narrated by Cassandra Campbell, Kathleen Gati, and Kathrin Kana – is a harrowing look at guilt — misplaced or not — and the affects of bonds between siblings, mothers and daughters, and even strangers during wartime. Nurturing supportive relationships with other women can ensure survival. Martha Hall Kelly is a native New Englander who lives in Connecticut and Martha’s Vineyard. She worked as an advertising copywriter for many years, raised three wonderful children who are now mostly out of the nest and Lilac Girls is her first novel. She is hard at work on the prequel to Lilac Girls. Stamped from the Beginning: The Definitive History of Racist Ideas in America by Ibram X. Kendi traces the origins of racism in the United States, noting that it began long before the civil war. In this volume, Kendi explores anti-racist ideas, uplift suasion (the idea that white people could be persuaded away from their racist ideas if they saw that Black people had improved their behaviors), and racism through the lens of five historical figures — Cotton Mather, Thomas Jefferson, William Lloyd Garrison, W.E.B. Du Bois, and Angela Davis. Through these interwoven histories, the myths of ignorance and hate causing racism and discrimination are dispelled to reveal that racial discrimination begot racist ideas and bred ignorance and hate, which to me should have been well understood by now. The fact that a comprehensive book of this nature is still needed and probably not as widely read as it should be shows how little we have traveled away from our past. Beginning with Aristotle and the barbarians of old, racism has a deep-seated hold on humanity, and these chains must be broken. The term “race” first appeared in a poem in 1481 called “The Hunt” by Jacques de Brézé, and it was used to refer to hunting dogs, but over the next 100 years it was used to “animalize” Africans. Reading this makes it clear to me that the penchant humanity has for categorizing everything into neat little boxes has only divided us for very little reason. The term “negars” was used in 1627, placing African slaves below servants in a hierarchy following the death of George Yeardley and the court decision regarding his estate. Africans were little more than cattle under this decision. It is these moments in history where a lack of understanding and a failure to properly research another culture and people have led European and American societies to denigrate the African people and their culture. Repeatedly, throughout history, the victims of this failure are abused — sometimes at the hands of their fellow Africans and blacks. Even W.E.B. Du Bois failed to grasp anti-racist ideals after he was afforded a college education that many of his brethren would never achieve. But here’s the rub, his education was at the hands of those who already had failed to properly research and understand a culture unlike their own and who had quickly labeled it inferior because of their own failure to understand or wish to understand. Kendi also delves into the inferiority of the Black woman, who as a group has been placed lower than the Black male because white men could not help but want to sleep with them and their mannerisms were not like the demur, white woman. Many of the stereotypes heaped on Black women today stem from these times, and they were never more plain than they were in the early suffragist movement. Even when it was clear that Africans knew more about how to combat smallpox, many white physicians failed to heed their advice because they are an inferior race. Logic and research again failed to permeate this scientific world. In more modern history, Kendi examines the role of the NAACP, providing a wider perspective of their role in racism. Although Kendi makes valid points about the group relative to his over-arching arguments, we also must remember that in our wider failings some good can be achieved — small as it may be — though after more than 200 years of oppression one can see why there is a growing impatience and anger about the continued racism against a people that are not inferior. There also is a section on Harper Lee’s book in which Kendi decries the classic as more racist propaganda in which Blacks must wait for white saviors like Atticus Finch. This perspective made me view the book a bit differently because I had always viewed it as a book in which a young girl first realizes that discrimination exists against Black people and that her father was fighting against that discrimination. Stamped from the Beginning: The Definitive History of Racist Ideas in America by Ibram X. Kendi is a comprehensive look at American racism through the Obama administration’s first years. It is not only Whites he takes to task for their racism, as he point out how Blacks also held racist ideas about their own culture and brethren. In the epilogue, he offers some ideas about how racism can be eliminated, such as the elimination of the mechanisms that generate racial disparities and the use of local protests to focus on immediate areas of discrimination and ensure greater equality. This is a book that should be read in classrooms and by everyone. Ibram X. Kendi is a New York Times best-selling author and historian located at the University of Florida. He won the National Book Award for Nonfiction for his book, Stamped from the Beginning: The Definitive History of Racist Ideas in America. Between the World and Me by Ta-Nehisi Coates, which was our May book club selection, is a no-holds-barred look at the construct of race in America. Through letters to his 15-year-old son, Coates attempts to demonstrate how his views on race changed over time, from the hard streets of Baltimore where posturing and violence against other blacks was expected to the intellectual and spiritual questioning he experienced at Howard University. I first listened to the audio as read by Coates, but it became clear to me that I was missing some of what he was saying. My second read in print was much more in-depth, allowing me the additional time to reflect on what I had read as I went along and re-read certain passages. This is not a book providing solutions to a son or the world, but it is a call to action. It’s a plea for everyone to be more mindful of our actions and the societal norms that allow certain people to do even the most mundane things without fear, such as listening to their music loud. What’s most prominent here is the failure of our education system to help those who need it most and to raise up those heroes in all communities, regardless of the violence they met or didn’t meet head on. While we celebrate Martin Luther King, Jr., there is often little talk about the violence endured by those in the civil rights movement and the perpetrators of that violence who were allowed to get away with it. Like Coates discusses, the American myth of exceptionalism does not allow for mistakes, though many were made in the birth of this nation, from the reliance and continued use of slaves to the ravaging of entire Native American populations in the name of progress. Becoming successful through struggle, however, should not be taken so far as to mean we purposefully make it harder for certain groups to achieve success of any kind and that we have the right to bulldoze others in order to achieve a goal. While Coates is very negative toward the world (and has a right to be), this book should probably be read in spurts so readers have time to sit with what each letter is and how it plays out on the whole. Reading it in one sitting without time for reflection can become a heavy endeavor, as any great work that requires empathy can do. 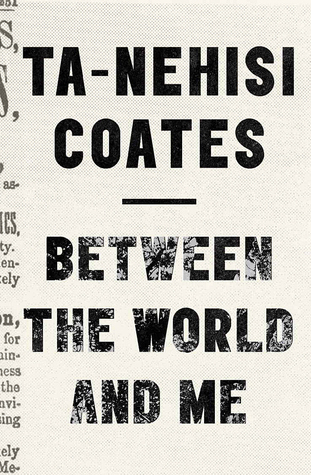 Between the World and Me by Ta-Nehisi Coates explores one man’s individual struggle growing up black in America against the backdrop of an America that continues to bury its dark past and make excuses for the perpetual prioritization of perceived “safety” above justice in which all are held to the same standards. Most of the book club found the biographical parts of the book the most interesting. Some suggested that his arguments vacillated from one side to the other over the course of the book, and often got muddled with internal arguments that he seemed to have with himself. There was a debate about the point of the book and whether it was supposed to be solutions provided by the end. There didn’t seem to be any solutions presented. There were debates about whether he focused too much of the text on anger toward the police and whites, while others thought some of the examples may not have been the best ones to prove his points about racism. Many agreed that the book was eye-opening if not well organized. Ta-Nehisi Coates is a senior editor for The Atlantic, where he writes about culture, politics, and social issues for TheAtlantic.com and the magazine. He is the author of the 2008 memoir The Beautiful Struggle: A Father, Two Sons, and an Unlikely Road to Manhood. His book Between the World and Me, released in 2015, won the National Book Award for Nonfiction. Coates received the MacArthur Foundation “Genius Grant” in 2015. 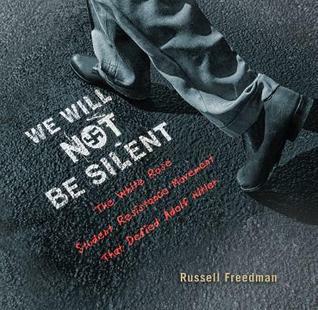 We Will Not Be Silent by Russell Freedman is a book about a resistance movement started by young boys and girls after they saw what the Hitler Youth movement was really like and what it was about. The White Rose movement ultimately came to the attention of the Gestapo, and while the Nazi regime looked for them, the student network continued to grow. Through a series of mimeographed leaflets that were left in doors and other locations, the students were able to call attention to Adolf Hitler’s terrible policies and the deaths of Germany’s citizens. Freedman uses a series of historical documents and photographs to chronicle the journey of the Scholls and how they came to oppose the regime and garner supporters. We Will Not Be Silent by Russell Freedman is a testament to the power of youthful conviction and social networks in opposing forces that are immoral and policies that are wrong. Russell Freedman received the Newbery Medal for LINCOLN: A PHOTOBIOGRAPHY. He is also the recipient of three Newbery Honors, a National Humanities Medal, the Sibert Medal, the Orbis Pictus Award, and the Laura Ingalls Wilder Award, and was selected to give the 2006 May Hill Arbuthnot Honor Lecture. All the Light We Cannot See by Anthony Doerr is a sweeping tale of World War II from the perspective of a German, Werner, and a French blind girl, Marie-Laure. Werner is a smart, young German boy who lives in an orphanage, while Marie-Laure is a young girl who goes blind and lives with her father in Paris. Both have faced some hardships, but both remain hopeful that life can be beautiful. Told from both perspectives as the war takes hold of Europe, Doerr creates a tale that is carefully woven together and tethered to the myth of the Sea of Flames, a diamond that some say is cursed and others say can provide miracles to those who possess it. Doerr does an excellent job of not only creating characters on both sides of the war with compelling stories, but also ensuring that there is a light of hope in each story to keep readers going. While the subject of WWII has become fodder for a number of novelists, very few will tell the story from the perspective of a young man swept up into the military because he dreams of a better life and learning that he cannot get in the orphanage. Readers will see a well crafted novel full of dynamic characters and symbolism, but they also will see that men and women on both sides of the war are not that different from each other and that the politics of the time is what drove the violence and indecency. 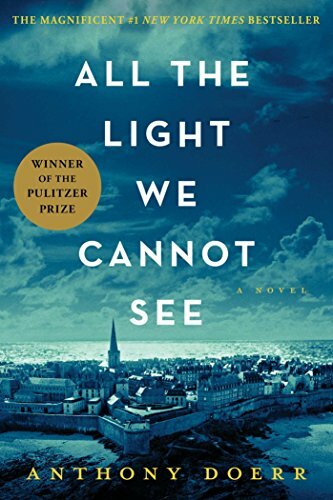 All the Light We Cannot See by Anthony Doerr won the Pulitzer Prize and for good reason. It’s a must read for those who love historical fiction and are looking for a detailed take on lives on both sides of the war. 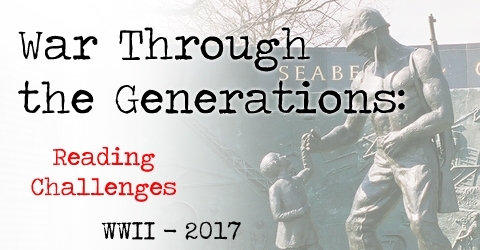 If you missed our read-a-long in March at War Through the Generations, check it out. 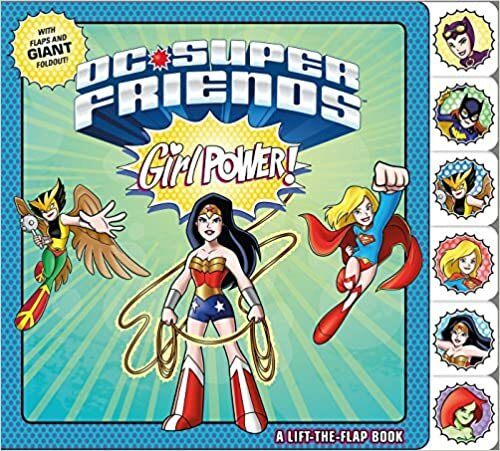 DC Super Friends: Girl Power! DC Super Friends: Girl Power! is a board book that introduces young readers to not only Super Girl and Wonder Woman, but also Catwoman and Poision Ivy. Catwoman has stolen jewelry in this one and the superheroes come together to find and bring her to justice. There are flaps to lift in every scene, and while my daughter enjoyed that part of it, it seemed a little young for her. Each of the characters have a young fresh face, which makes them easy to relate to for young children. The flaps will keep preschool and younger children engaged as their parents read the text to them. But lest you think the male counterparts are not to be seen, the book also includes Superman, Green Lantern, Two-Face, and more. They all work together to fight against injustice and crime, and at the end they celebrate together. Meanwhile, Catwoman is foiled by a fellow villain, Cheetah — which further demonstrates that crime not only doesn’t pay but that there seems to be no loyalty and friendship in it. DC Super Friends: Girl Power! is a good board book introduction for younger kids, but for those in Kindergarten, the story is a little all over the place and more about introducing characters than a fight against crime. Filed Under: borrowed copy, children's fiction, Read in 2017, reviews Tagged With: DC Super Friends: Girl Power! 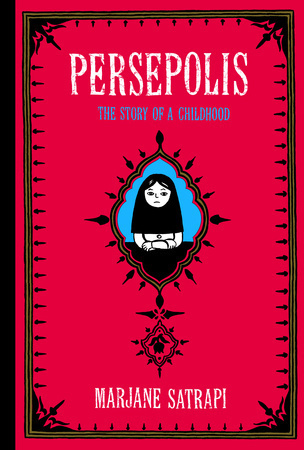 Persepolis: The Story of a Childhood by Marjane Satrapi, which was our February book club selection, takes its name from an old Persian city, also called Pārsa, that was destroyed by Alexander the Great around 330 BC and is located in present day Iran. Because of the nation’s geographic location and, later, its oil riches, Iran became a prime target for invaders of all types, including Iraq and the West. In these pages, Satrapi recounts her childhood in Iran during the Islamic Revolution in which the Shah who supported the United States was overthrown by student, fundamentalist, and Islamic groups and replaced by Ayatollah Khomeini and later created the Islamic Republic. As a child, Satrapi is quick to passionate responses and, yet, is confused about what it means to be a revolutionary. She tries to outdo her classmates with her own stories of family heroism, but she soon realizes that it is not the kind of competition you want to win, even on just the school yard. There are dire consequences to opposing a fundamentalist regime. This memoir, however, focuses less on the politics and more on the human aspects of this revolution. The confusion of coups and the realization that war is devastating can touch each person in unexpected ways. Whether it is an elevation in status, fear of being singled out by others who are afraid, or even the death of loved ones, neighbors, and friends. Satrapi was a young girl who loved school, found reading to be a solace, and strove to fit in. These are individuals, their country’s policies and actions may not reflect each person’s desires. Persepolis: The Story of a Childhood by Marjane Satrapi should serve as a reminder of what revolution can lead to, how it affects everyone differently, and how the consequences cannot be ignored. It must have been unimaginably hard to raise a young girl at this time, especially one as outspoken as Satrapi was. Marjane Satrapi was born in 1969 in Rasht, Iran. She grew up in Tehran, where she studied at the French school, before leaving for Vienna and Strasbourg to study decorative arts. She currently lives in Paris, where she is at work on the sequel to Persepolis. She is also the author of several children’s books. The book club all seemed to have enjoyed this graphic memoir. And the discussion was rather animated about the politics of the time and the religious fanaticism that took over Iran’s government. There were also interesting discussions about how her parents allowed her certain liberties even when they knew that neighbors informed on others and some were even in charge of ensuring women dressed and acted according to the new laws of the land. This was probably the most animated discussion in a long while, and some of us cannot wait to read the rest of the series.